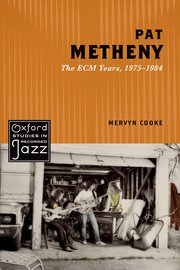 Mervyn Cooke, Professor of Music at the University of Nottingham, meets such criticism head on in this study of Metheny’s recordings for ECM (Bright Size Life to Rejoicing), readily acknowledging the many apparent paradoxes that characterise his subject’s musical reputation. Metheny’s music is, his detractors claim, bland and commercial, yet the man himself is as much an unabashed admirer of Ornette Coleman as of his great hero Wes Montgomery; he dislikes having his music labelled ‘fusion’, yet his Grammys place him firmly in that musical category; he made his name with ECM, yet accuses label boss Manfred Eicher of putting ‘a dark blue barrier … between us and the tape’. The meat of the book, however, is found in Cooke’s scrupulously detailed musical analysis. Illustrating his descriptions with copious musical examples, he surveys Metheny’s decade at ECM album by album, concentrating on the leader himself, but also acknowledging the contributions of Danny Gottlieb, Nana Vasconcelos, Mark Egan, Lyle Mays et al., and concludes with this ringing endorsement: ‘… this balancing act [between the spiritual and the mathematical, loud notes and soft notes, lots of chords and simple chords, free and structured] constantly aspired to promote the overriding ideal of the new paradigm which lay behind all Metheny’s music: the passionate commitment to find ways in which a jazz-based idiom might communicate meaningfully to a contemporary audience versed in contemporary musical styles’.